Monica B. Pearl: AIDS Literature and Gay Identity. The Literature of Loss. Any disease can be imagined in the form of a narrative. It has a beginning (the discovery of symptoms, a diagnosis), a middle (treatment, acceptance or raging against the dying of the light) and an ending, which can be happy (cure) or sad (death). Monica B. Pearls engaging and (in spite of its relative brevity) profound book attempts to delineate the trajectory of AIDS by way of its literary representations. First, Pearl investigates how changing socio-political, cultural and pharmaceutical circumstances since the early 1980s have resulted in different (narrative and medical) arcs in individual descriptions of the illness. In a second step, Pearl uses these individual analyses in order to establish an underlying narrative of the disease itself. 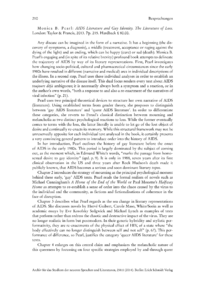 This dual focus renders every text about AIDS toujours déjà ambiguous; it is necessarily always both a symptom and a reaction, or in the authors own words, both a response to and also a re-enactment of the narratives of viral infection.